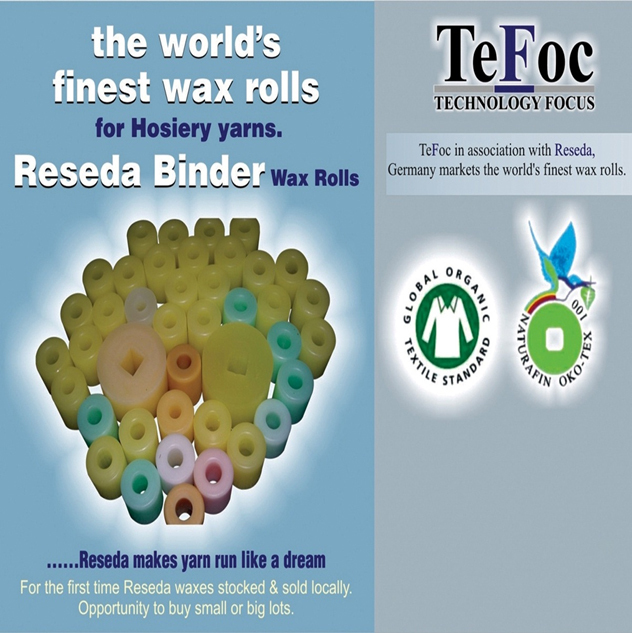 Reseda Binder is a German Based Traditional family owned company with 10 decades of experience and with modern manufacturing facilities the company meets the demanding requirement in the field of waxing the Hosiery/Knitting Yarns. Made of 100 % Ultimate purity Paraffin with 100 % Bio- degradable. Certified by Oeko-tex, Eco-Passport & GOTS (Global Organic Textile Standards). NATURAFIN GREEN Coarse crystalline 59-61*c 19 — 20 Wool,cotton,cotton blends. Recommended for larger Applications for wax , Such as wool Yarns and Bleached yarns. NATURAFIN BLUE Fine crystalline 56-58*c 24 — 26 For yarns spun with soft twist or at low Yarn tension. TeFoc made these wax rolls easily available in Coimbatore even for small lots by stocking & selling in INR. 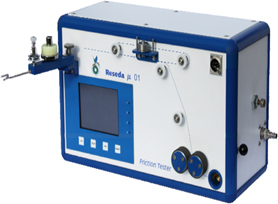 TeFoc made Reseda’s Friction Tester available in Coimbatore for testing the Yarn Friction levels with longer sample lengths . 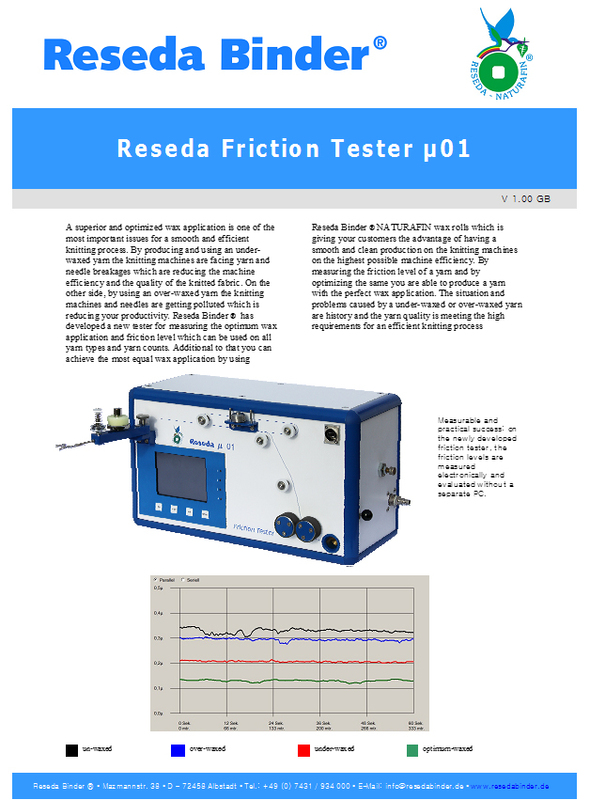 Spinners can make use of this facility to know their friction levels in their yarn. Friction Behaviours of Different Yarns at different volumes of Waxing. 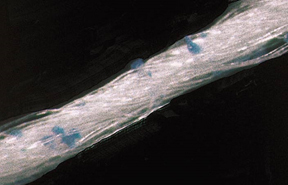 Black– Frictional Level of un waxed yarn which is at higher levels . Blue – Frictional Level of Overwaxed Yarn which is also higher due to the resistance in free movement of yarn because of higer waxing. 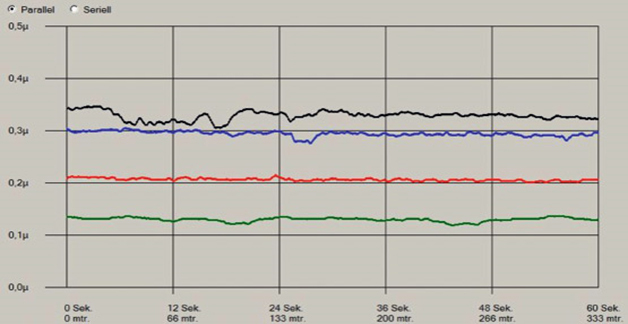 Green – Optimum Waxed yarn Frictional behaviour lies between at the range of .15u( Our Reseda Waxed yarn provides the Optimum Friction).